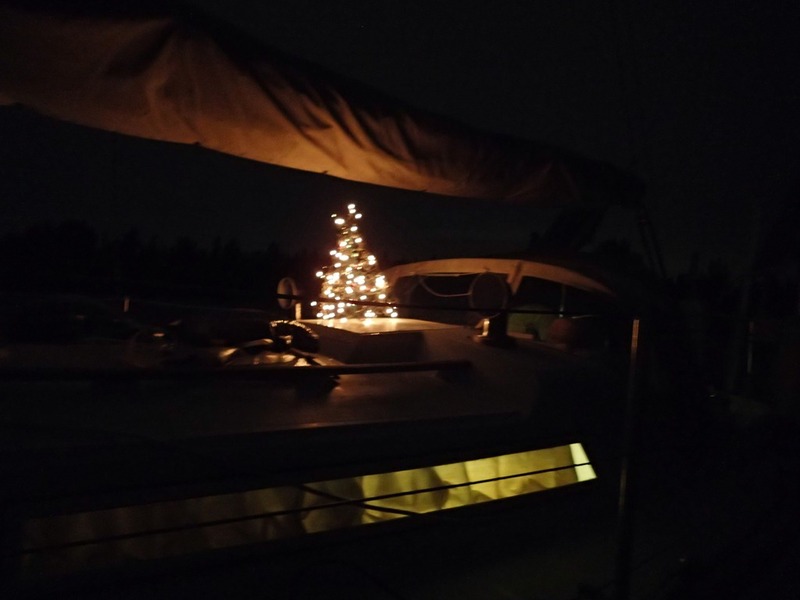 We celebrated Christmas at the Vero Beach city marina, where we’re on a mooring. 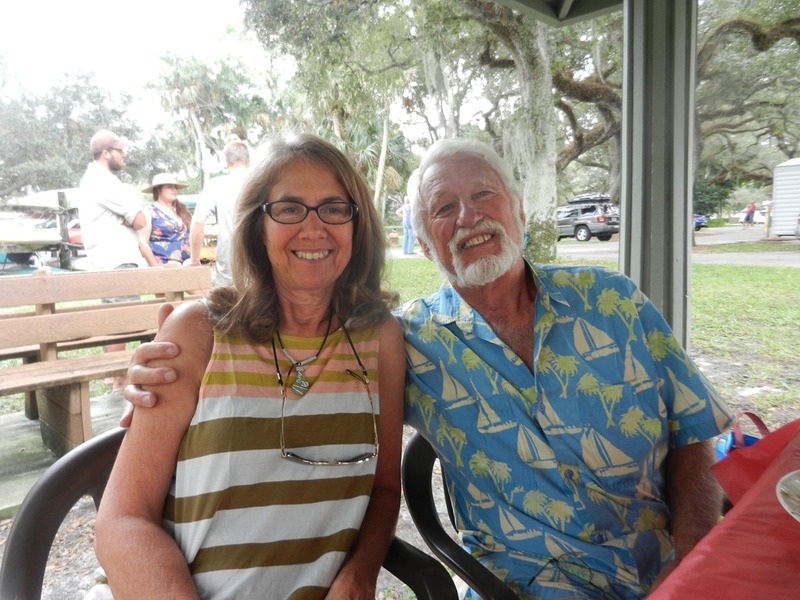 All the cruising boats here – and there are a lot of them – got together for a potluck dinner. Delicious food and very fun – it was a beautiful day for a holiday picnic and we met lots of fascinating people. The marina laundry room was turned into a giant buffet. It’s long and narrow, with washing machines down one side and dryers on the other. Someone draped red plastic table cloths over the machines and the food went on top – one washer supported all the salads, a dryer hosted desserts, and so on and so on. We walked down the middle and filled our plates. Super yummy. We also got to talk with our family by phone and via skype. Super nice. We made the inside festive as well. 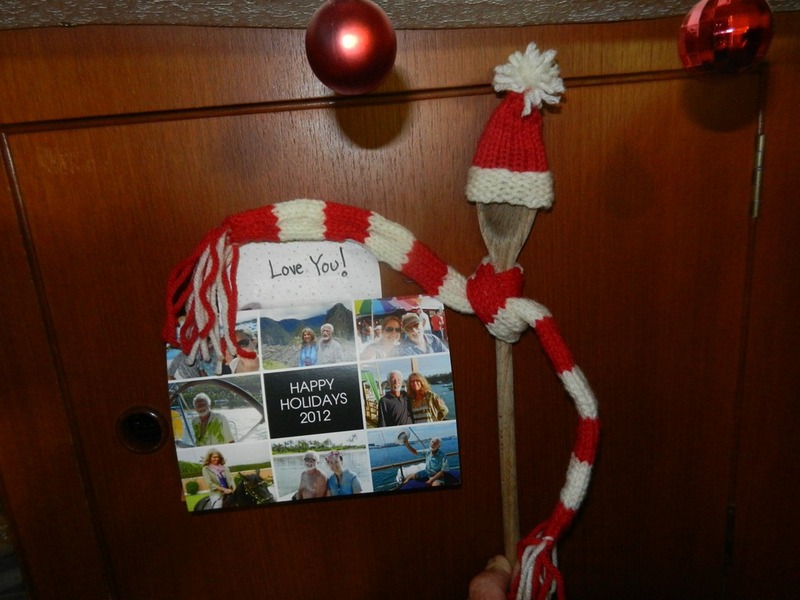 Here’s our holiday card and a “Love You” note our daughter tucked into a package of boat parts she’d forwarded to us. The little spoon guy was a project of mine. Amelia even sent us a bit of homemade candy, a yearly treat from my sister. Excellent! For Christmas Eve dinner we had one of our favorite meals, a dish we just call “Mexican.” It’s something we created many years ago and still love. As the name suggests, it involves lots of chips, cheese, and guacamole. We hope you are all able to find some happiness and peace during this holiday season. I love the venue for the potluck! Always said if we went south again I’d do a blog on ‘laundromats we have known’. You can have almost as much fun there as you do on the water. Glad you’re enjoying the holiday season, fair winds and smooth seas for the new year. Good luck on that crossing! You guys sure know how to live! We loved your holiday card and we love your blog. Here’s to a peaceful and happy new year! Merry post-Christmas to you and Goldy from Ross and me. I have been enjoying your posts, including those from Machu Pichu which Sarah shared with me. You sure know how to be retired! Best to you both and Happy Sailing in 2013! merry Christmas Goldie and Nancy. I envy you and your travels, I am so glad that you are able to do this now. Think of you often. So great to hear from you. Yes, we wanted to make this trip as soon as I retired, while we still could. Hope you and your family are doing well. So delighted to hear from you. Glad you are following us. Hoe all is well.